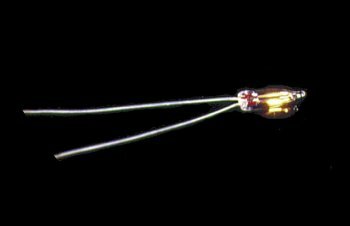 These are the smallest flame-tip bulbs to be found anywhere, measuring a mere .079" (2.0 mm) in diameter. Use wherever a "to scale" flame look is desired. Excellent for chandeliers, sconces, and coach lamps requiring extremely small bulbs. Comes with solid 1" wire terminals. Current drain: 40 ma. The CK1010-12 bulbs should be used in conjunction with the CK1010-16 and -17 candle bodies to create fixtures with easily replaceable bulbs. 2,500 hour bulb life.